Descriptions: On Mar 28th 2017 US-CERT notified it’s users about this vulnerability with VMware ESXi hosts. The remediation of this vulnerability is to update the ESXi hosts with the patch recommended by VMware. 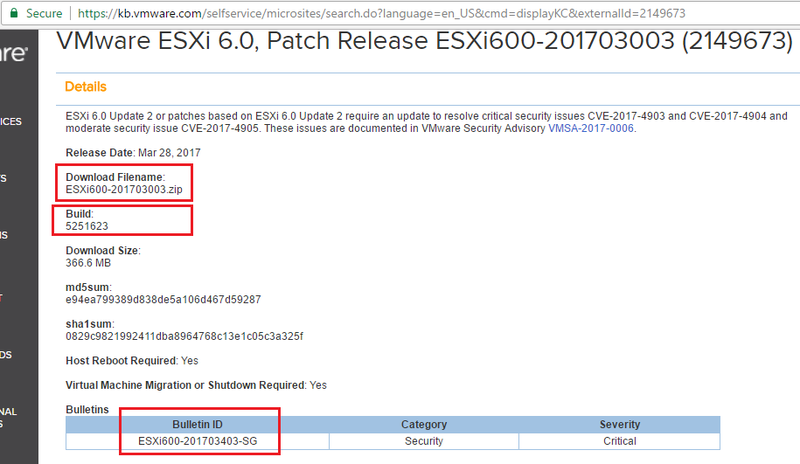 In my case the recommended patch was ESXi600-201703003.zip as my VMware ESXi servers are running on version 6.0 U2. 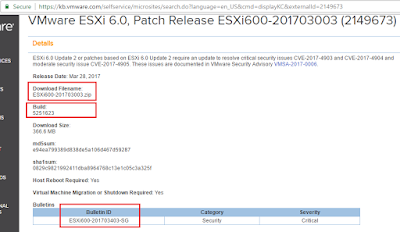 Scenario: As I am using ESXi Server version 6.0 U2, the recommended patches details are as below as per the reported vulnerability security advisory reference KB. You have to scroll down the page till the end to see these patches details as shown in the below screenshot. https://kb.vmware.com/selfservice/microsites/search.do?language=en_US&cmd=displayKC&externalId=2149673 to verify and check the information about required patch file. It should be containing following information as highlighted in red in the below screenshot. This is the same URL which was given in security advisory (can see the very first screenshot in this article for reference). 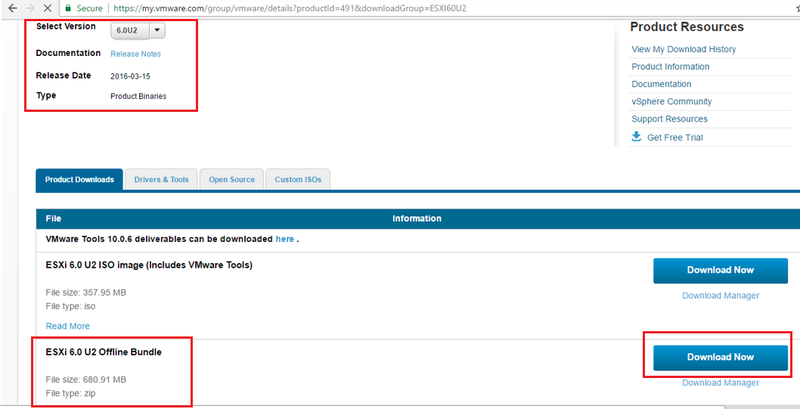 You must be logged-in in the “My VMware” portal to be able to access this patch download windows. 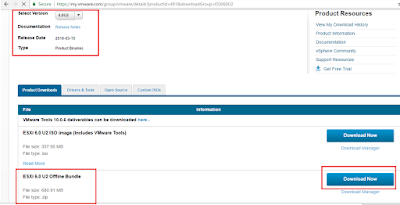 After downloading the path file will be appearing like below in a .Zip file format. Use this file to update the patches on all affected VMware ESXi servers. You can use either manual method of installing this patch on all affected ESXi servers or you can use the easiest method of doing it by using VMware vSphere update manager. I am a lazy administrator so don’t expect me to do this patching activity manually. Yes, I used the easiest method of doing it by using Update manager. I have posted all the steps in my another article How to use Update Manager for patch installation on ESXi servers? . You can refer this article if you want to use Update manager for installing these updates on your ESXi hosts.